The Canadian lynx, primarily found in Canada and in the northern states of Maine, Minnesota, Montana, Wyoming and Washington, was sighted, photographed and trapped east of Ruth this past weekend. Doug Regentin of Deckerville, received a phone call from his father-in-law, Joe (Cindy) McCoy on Saturday morning, after Joe discovered that something had killed two of his geese and a duck, which were in a fenced-in pen. Joe had spotted the lynx late in the day on Friday. Doug arrived with his Nikon D70 camera and 400mm lens around 9:30 a.m., waiting in his car with hopes of spotting the lynx. After waiting about 15 minutes and not seeing anything, he drove to Tom Halifax’s home (Joe’s nephew) to pick up a trail camera. A short 10 minutes later, the lynx was spotted approaching the west end of the pen, where one of the dead geese was lying against the fence of the pen. Brett McCoy (Joe’s son) and local trapper, Jordon Cook took cell phone videos of the animal, and Regentin grabbed his camera, getting photos. The lynx watched the three men, but it was determined to feast on the goose. After a short while, it walked back through the field, toward a swale area. The lynx wasn’t spotted again until around 3:30 p.m., when it returned back to the pen. It was again eating the carcass, and eventually succeeded in pulling the goose through the fence, dragging it through the grassy area. To make the story even better, a second lynx was spotted on Sunday morning! Cook, who had set some soft traps on Saturday night, captured the first lynx, and next to it, Joe McCoy spotted a second lynx, lying only a few short feet from the captured one. Regentin returned to get more pictures, but the second cat had already left. He did get pictures of the trapped lynx, but stayed a safe distance from it. 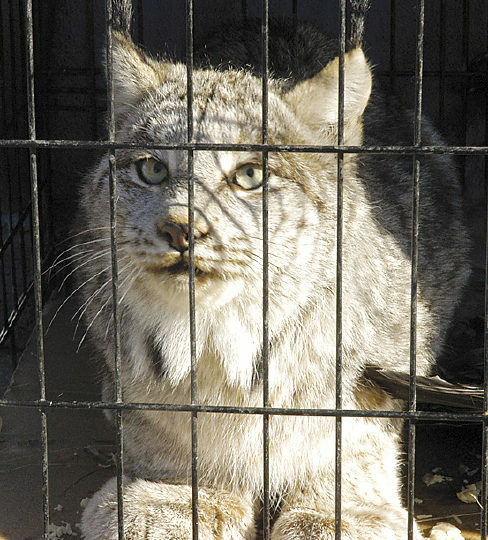 A short time later, Cook and a trapping crew removed the lynx from the soft trap, placing it and a portion of the goose carcass into a large dog crate. The trapped cat is a female, and was not injured. It seemed “somewhat docile” after being put in the crate, lying down and fairly calm. The cat became more aggressive about a half hour later, hissing when Cook and Brett McCoy poured water onto a plate in the crate for it to drink. A blanket was placed over the crate, except for one side, so that the cat could see out, and also be seen by the second lynx, if it came back. Some strands of hair and a tiny amount of blood from the trap were secured for possible DNA testing. 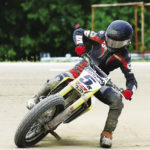 The DNR (Department of Natural Resources) was contacted, including DNR Officer Siemen. Siemen is hoping to do some more research to possibly determine how these animals reached Huron County. 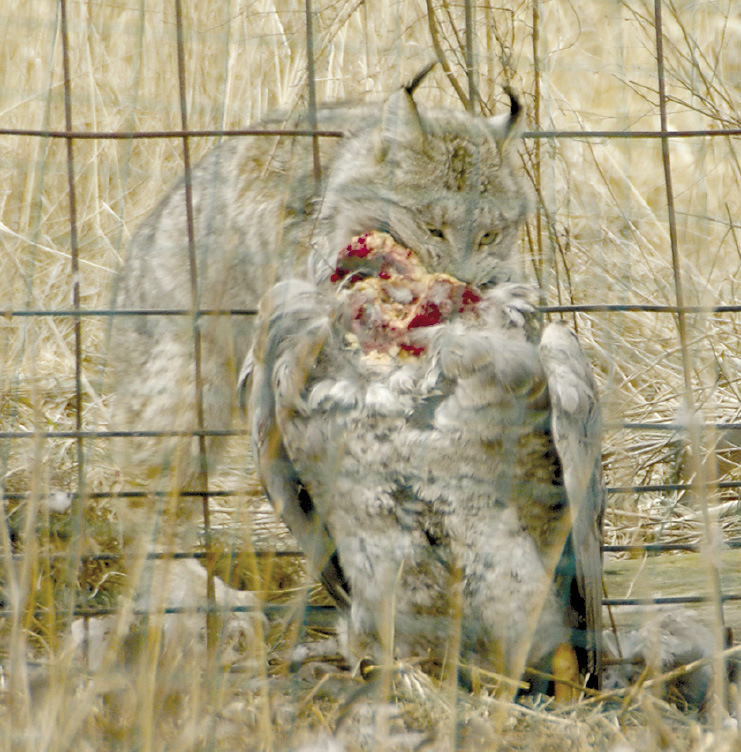 The lynx removes a fresh goose kill from an farm enclosure on Saturday. The cat was determined to take the goose. Landowner Joe McCoy had the final say on what to do with the trapped lynx. Shooting the predator was never ever an option. McCoy said, “These 20 acres have been left natural the whole time I’ve lived here; I don’t hunt it and neither do my kids. I love watching nature here.” But what do they do with the lynx? After much discussion with family members and friends, it was determined to allow the DNR to take possession of the lynx. According to the DNR, this would likely take place in the Upper Peninsula as Michigan’s Thumb area is poor habitat for an animal who prefers a large territory of dense conifer or boreal forests. Some people confuse the lynx with a bobcat, but there are distinctive differences. The lynx prefers forested areas, where its main source of food, snowshoe hares, live. The bobcat lives in a more varied habitat – from marshes and swampy areas in the southern part of the continent to desert and shrub areas in the western regions and mountainous and forested areas in the north. The only area where both co-exist is along the U.S. – Canadian border. The bobcat looks more like an overgrown house cat than the lynx does. It has extra-long tufts of fur on its ears and a more shaggy mane of fur around its cheeks. The lynx had long black ear tufts, which can grow to almost an inch long, which act as excellent hearing aids. Both have soft coats, which are prized possessions for the fur industry. The bobcat population is somewhat stable, but the Canadian lynx is listed as threatened under the Endangered Species Act. 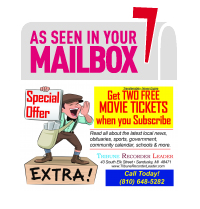 The Tribune Recorder Leader would like to thank Doug Regentin for the use of his pictures and information for this article. 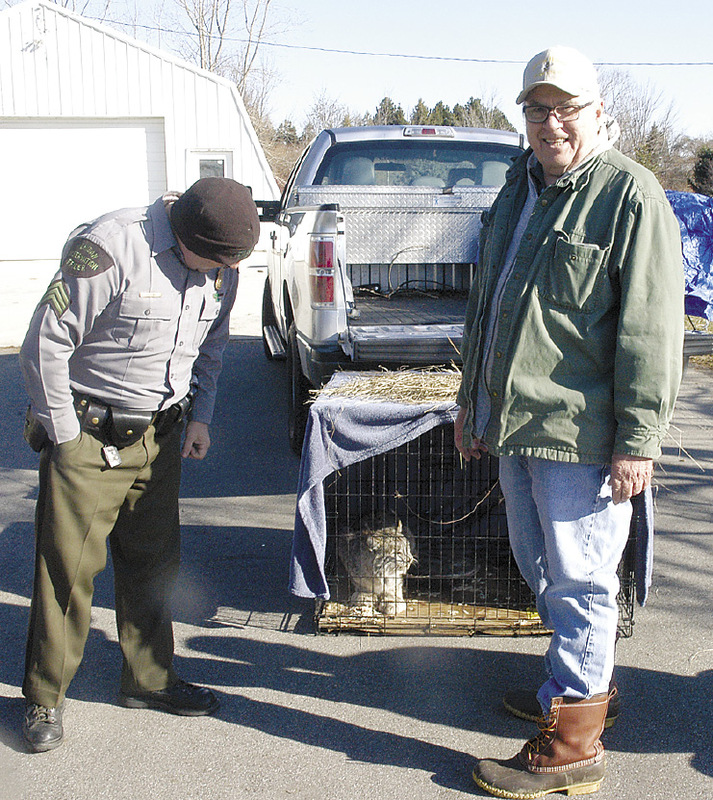 Joe McCoy (right) stands with DNR Officer Brown and the caged female lynx, one of two spotted over the weekend.